Spain most notably known for the wines from Rioja and Ribera Del Duero, has a region that is often shadowed by its western neighbors. The wines of Navarra are well made and are Spain’s hidden gems. Navarra is located in Northern Spain between the Pyrenees Mountain and the Ebro River. It is a region with a rich history of culture, art, wine and cuisine. The capital of the region is Pamplona, most notably known for attracting thrill seekers to run with the bulls. Navarra is also a region beautifully articulated by Hemingway in The Sun Also Rises. A region known for growing high quality produce and also a bustling culinary scene with it Michelin Star restaurants. Most notable and possibly the best kept secret is the wonderful wines that come from this region. Navarra offers whites, rosés and red wines, in a diverse range of styles due to its varied and unique terroirs. There are three distinct climates, Atlantic, Continental and Meditterean in one very exciting wine region. Winemakers have a focus on innovation and experimentation combined with deep respect for the land and it’s traditions. The wines run a gamut of styles from crisp mineral driven whites, to pink fruit forward rosados, to concentrated spicy reds, and luscious sweet dessert wines. The history of winemaking in Navarra dates back to the 1st century A.D. and then gained popularity and respect in the Middle Ages. It was not until more recently, in 1933 that the region obtained its D.O. status. For many years Garnacha was the most widely planted grape mixed with fruits, vegetables and high quality produce that Navarra is most known for. Garnacha was used to produce rosé wines. The Spanish loved the color and fruit forwardness of rosés. It was not until the 1960’s that pioneering efforts by local winemakers and government funded research, lead to plantings of Tempranillo, Cabernet Sauvignon, Merlot and Chardonnay. Today Tempranillo is the most widely planted grape varietal of the region. Though in recent years, winemakers have come back full circle and regard Garnacha as a national treasure. 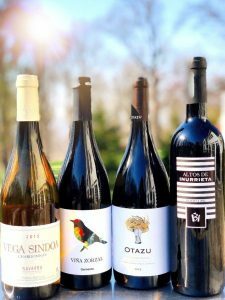 Many winemakers are returning to tradition and are putting greats efforts to create world-class wines from Garnacha with bright flavors, concentration and complexity.